My idea for this look was to create something sultry and vampy while still remaining wearable. This red lip with matching soft red eyes would go well pared with vampire teeth, green and yellow werewolf contacts, a devil's horn headband, witch's hat, or any other creative creature accessory you can come up with. It is a great way to put together any last minute Halloween costume (15 days and counting!). Within the next two weeks I will be posting several more Halloween inspired looks that are easy to pull off and accessorize. 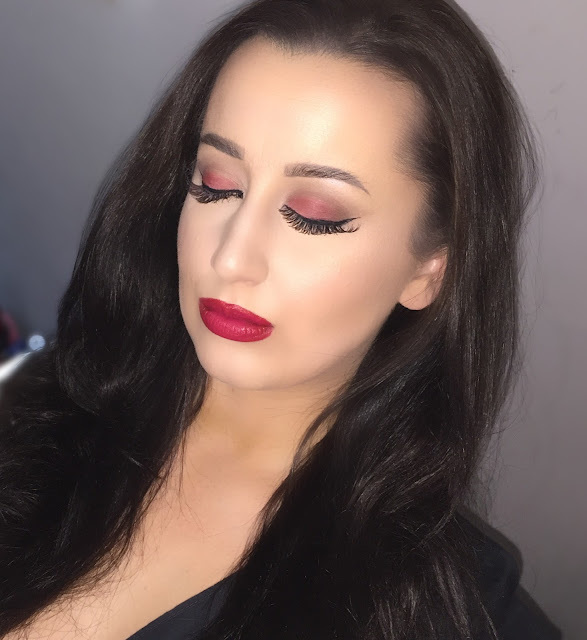 Check out my previous post Vampy Ombre Lips to add even more glam to this look with a vampy, pigmented red-orange ombre lip in place of the bright red. Starting with the basics: I moisturize my face with Clinique Dramatically Different Moisturizing Lotion and my under eye area with ELF Eye Illuminating Cream. I prime my skin with Laura Mercier Foundation Primer in Radiance and prime my under eye area with ELF Hydrating Under Eye Primer. Using a Beauty Blender, I apply Kat Von D Lock-It Tattoo Foundation in Light 29 to my entire face. To highlight and conceal I use NARS Radiant Creamy Concealer in Vanilla in a V-shape beneath my eyes, in the middle of my forehead, down the bridge of my nose, on my chin, and on my eye lids. Using a flat shadow brush I take the red-orange blush color from the Morphe Brushes 9B Blush Palette and press it onto the center of my eye lid and bring it down into my inner corner. Once the color is as pigmented as I want it to be I go in with the shade Bitten by Makeup Geek, a matte deep maroon red, to increase the red color. I then go back in with a crease brush and just make sure the crease and the outer V are just slightly blended enough that there are no harsh lines. I take a small angled brush to draw on my eye liner using the NYX Gel Liner in Jet Black. I get as close to the lash line as possible and press down on the lid to create a black line. I wing this out when I reach the outer corner of my eye. I wanted the lips to stand out in this look just as much as the eyes. I line my lips using Femme Fatale Lip Pencil by Essence Cosmetics. I fill in the rest of my lips with NARS Velvet Matte Lip pencil in Cruella. Finally, I layer Kat Von D Everlasting Liquid Lipstick in Bachelorette over everything. I set the entire look with Urban Decay De-slick Makeup Setting Spray. Do you have any plans to be a Dracula, vampire, werewolf, or creature of the night for Halloween this year? Are you planning on any special makeup purchases to create your look? Subscribe For AEB Email and Newsletter Updates!